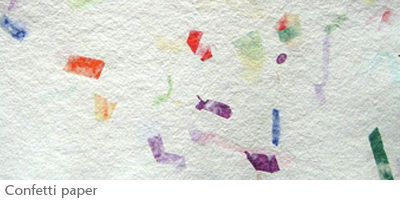 Paper making is a time-intensive but simple process. Here is a brief description of the steps I follow. I begin with a large vat of water mixed with pulp (cotton fiber). 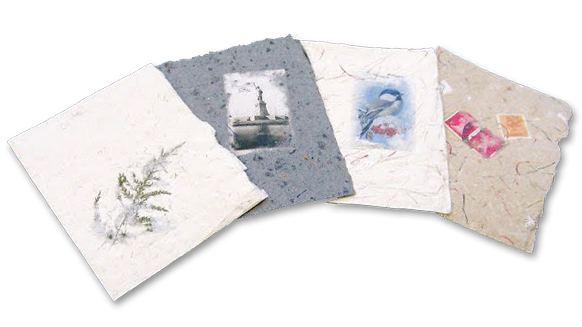 Adding a variety of inclusions made from natural materials (grass, leaves, vines, flower petals and ferns) to other items including silk, polyester threads, Xerox images, glitter and newspaper, different papers can be created. Once the pulp is mixed with the inclusions the next step begins. To make individual sheets of paper an open frame and a frame with a tightly stretched mesh screen, called a deckle, is used. Holding the frame and deckle, I use a fluid scooping motion, passing both through the pulp allowing the water to drain into the vat below. Once drained, the frame is removed and the deckle is turned over onto a felt pad. With a downward pressure, the remaining water is pushed away from the fibers trapped between the screen and pad. Removing the deckle reveals a unique sheet of handmade paper. Another pad is placed on top of this sheet and the process is repeated up to 50 times. 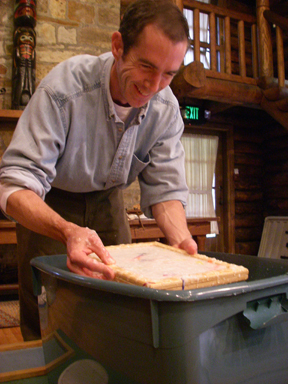 By pressing this stack between two wooden boards, the remaining water is expelled. Up to 12 hours later, the sheets are removed to air-dry. Once a sheet is completely dry and flat, I begin creating some of the items you see here! Click or mouse over the small images for enlargements. 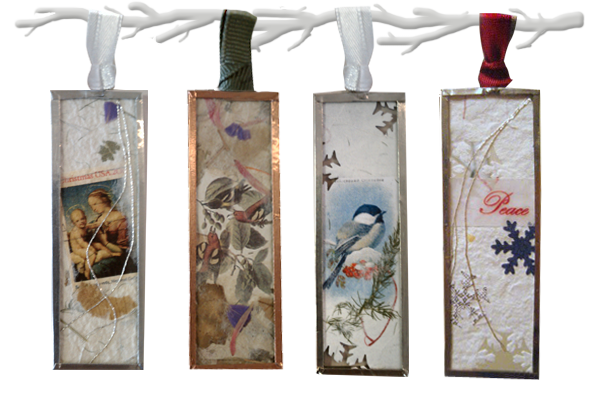 Each ornament I create uses a combination of handmade paper and other collage materials. Once the interior collage is complete, I encase it between two thin pieces of glass using a silver, copper or gold finish band. Each ornament is then finished with a soldered loop and ribbon. Please contact me for current stock information or to inquire about creating custom cards or ornaments for your own special occasion.